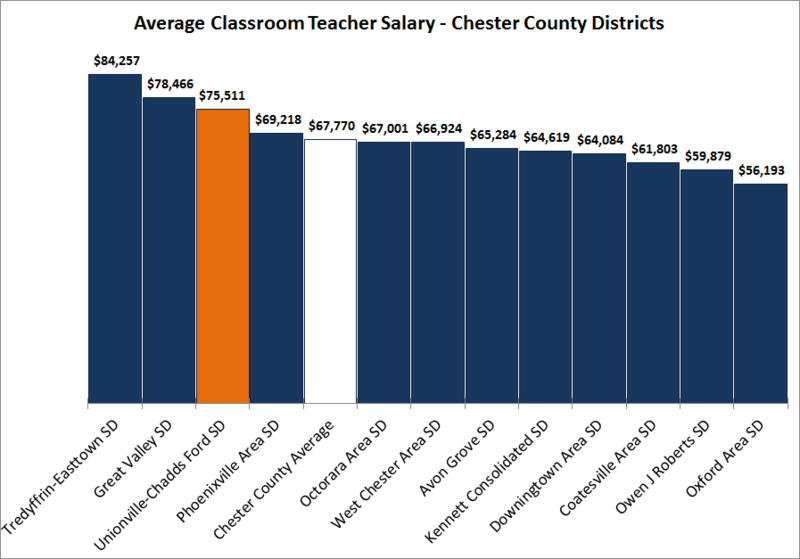 In my prior post we looked at Unionville-Chadds Ford (UCF) teacher pay. Today we compare teacher pay in UCF to other school districts in Pennsylvania. If we are going to attract, retain, and reward Great Teachers, our compensation needs to be competitive. This is going to be chart-intensive. If you don’t like data and charts, proceed at your own risk! For certain comparisons I have normalized out the difference in experience/education levels in order to isolate the absolute salary scale differences. These data sets are called “normalized salaries”. I pulled data for the ~500 public school districts (“LEAs”) and excluded charter schools, intermediate units, and other non-standard entities. In my prior post, we saw that classroom teachers in UCF earn, on average, $75,510. The state average, shown in the chart below, is $64,084. So UCF pays 18% more than the average PA school district, which places UCF at the 91st percentile (44th of 499) for average pay. Within Chester County, average teacher pay at UCF is in the top quartile (3rd out of 12) and is 11% above the county average of $67,770. 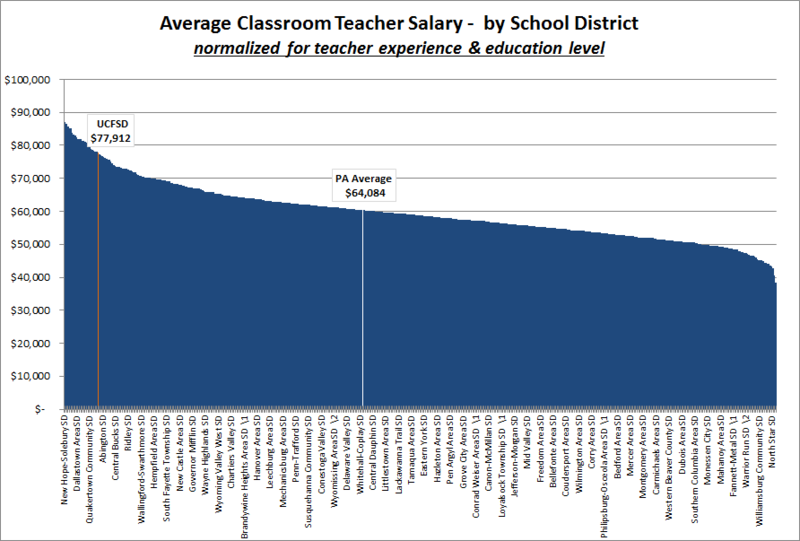 In order to have truly comparable salaries, we must normalize district average salaries to eliminate the pay effects of differences in teacher experience and advanced degrees. This enables us to make a ‘like for like’ comparison of average salaries across districts. On a normalized basis, UCF occupies a slightly higher position on salaries state-wide. On a like for like basis, UCF pays $77,912 vs. the state average of $64,084, or a premium of 21%. This places UCF at the 95th percentile (25th out of 499 districts). 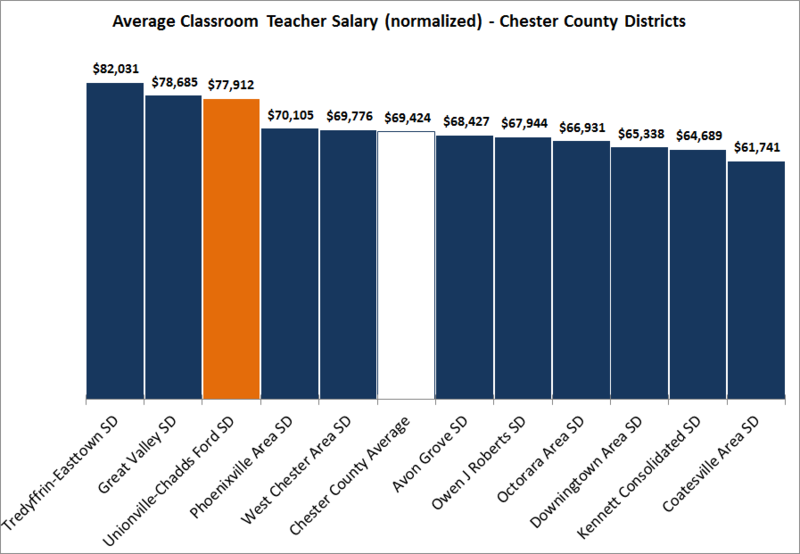 Within Chester County, average teacher pay at UCFSD remains in the top quartile (3rd out of 12) and is 9% above the normalized county average of $69,424. So from analyzing normalized salaries, we can see that UCF pays very well compared to other districts in the state (95th percentile) and within the county (3rd out of 11 districts). UCF is a high-performing district academically. How do our teacher salaries compare against other high-performing districts in the state? 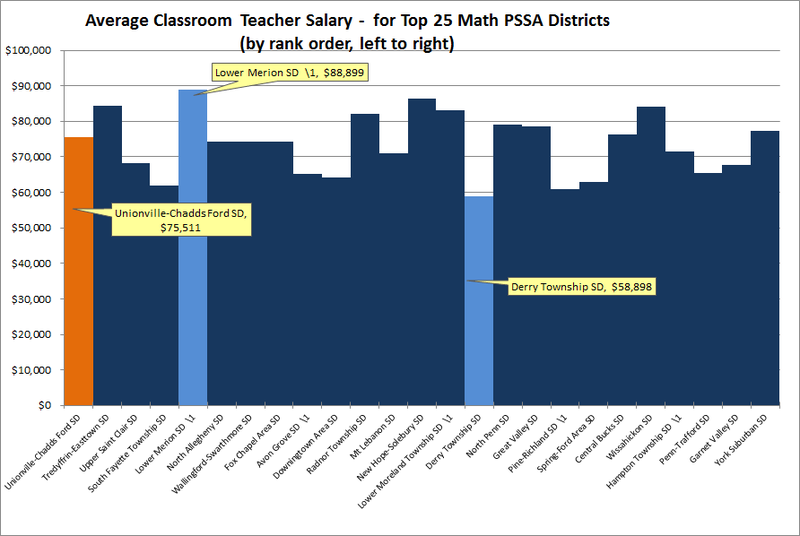 The chart below shows the top 25 school districts in math PSSA results from first (on the left) to 25th (on the right). UCF is ranked #1 on Math PSSAs, and pays middle of the pack compared with this peer group of top performing districts (average is $73,440). 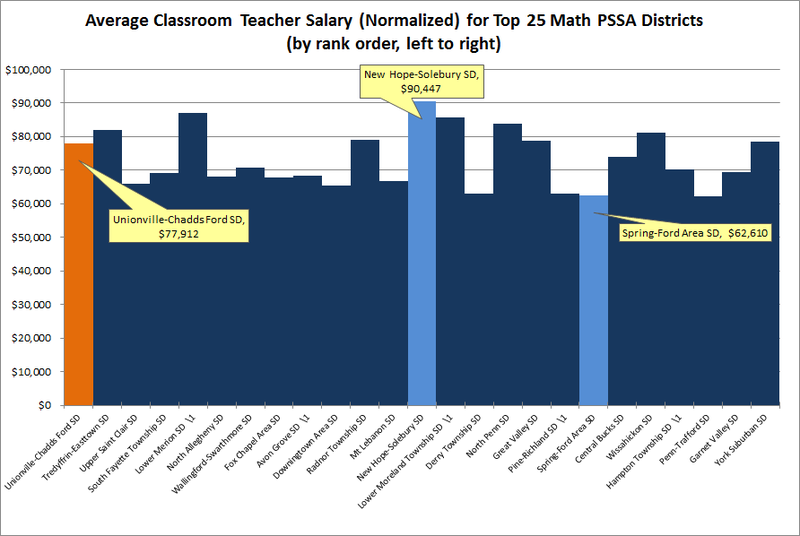 Using normalized salaries for the top 25 math school district tells a similar story. UCF’s normalized pay of $77,912 is 6% above the average for the peer group of $73,035, and is ranked 10th out of 25, or 60th percentile. 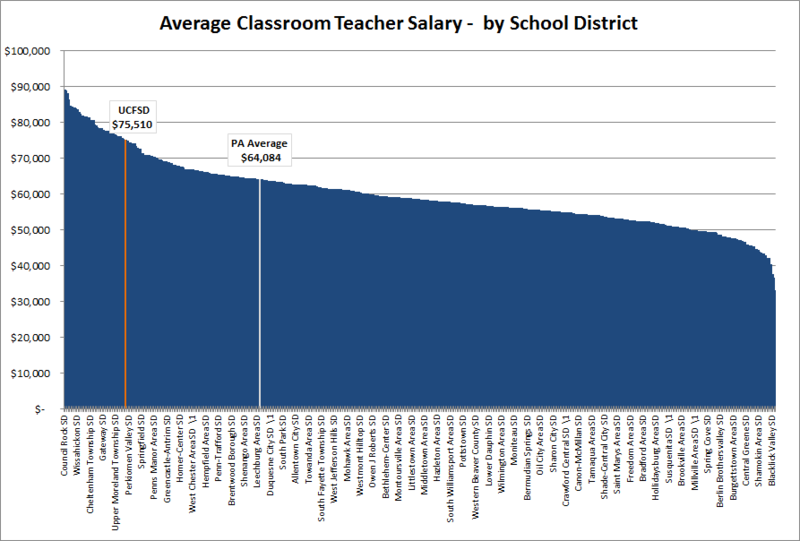 UCF teacher salaries place our district in the top 9% of all districts in Pennsylvania. After normalizing for step/lane mix differences, UCF pays in the top 5%, and 21% above the average district in Pennsylvania. Among Chester County districts, UCF salaries are in the top quartile. When compared against a peer group of the 25 top performing districts, UCF pay is in the top third. Our teachers have less experience than state averages, but hold more advanced degrees. This entry was posted in Rewarding Great Teaching on January 27, 2015 by Bob Sage. I never thought we see another data hog the likes of Keith but now I have to admit he has been overtaken. Keith, now it’s official. You can retire knowing that we’re in good hands! By the way, I think you guys both know this but we do not usually have to pay top salaries at UCFSD to get top talent. I can tell you from personal experience that we could certainly attract top talent due to the quality of our students, our supportive parents, and our excellent administration. I’ve taught at third tier and second tier public high schools and from my experience most teachers want to and will come teach at a top tier district like UCF if they had the opportunity. The main constraining force is the financial penalty they might have to pay should they have to move to a lower step. In the past we have allowed talent we want, such as [edit – name removed] to enter at a similar step and I support this in the future. I am not arguing for a reduced pay scale but just emphasizing how desirable it is to teach under UCF conditions. In all my experience, I’ve seen dozens of teachers come in and none leave for a better teaching opportunity. All the fancy graphs and charts don’t change the fact that teachers are criminally underpaid for what they do as a whole. UCF may pay well compared to other schools, but that’s besides the point. Sam- You are not alone in that point of view. Can you elaborate? And perhaps provide some of your reasoning?